Jan 16 Should you go to the Everglades in Florida? The Everglades is actually stunning if you go alone. I've gone on four safaris in Africa (South Africa, Zimbabwe, Kenya and Botswana). I've been to Galapagos. I've chased down jaguars in Belize. I've even swam with whale sharks in Cancun. Today, I went to the Everglades for the alligator tour with an open mind especially since, sure, my expectations are set high when it comes to safaris. Did the tour measure up, even with a low bar? Here's the thing about the Everglades. It's beautiful. It's swampy and marshy and haunting and photogenic. It's what you see in movies when they film out here, a whole other world and, well, everything you'd imagine. It's also chockfull of alligators, so tour companies head out here with tours designed like a safari. But, when we think "safari," we think glam, one-of-a-kind, bucket-list material, so that's where it gets complicated. There are no luxury lodges in Florida's backyard. Nobody wears designer outfits. There's no mind-blowing surprises, no restaurants serving gourmet food, no tricked-out spa. My friend Christian and I visited Everglades Holiday Park (just 30 minutes outside Fort Lauderdale). It's the type of place that features "live alligator presentations," which we found out as soon as we pulled up to the trailer park-style tourist emporium. The main attraction is the boat tour, and Christian was excited to see alligators, especially in Florida. I mean, who doesn't want to see these amazing, prehistoric creatures in their natural habitat with the actual soundtrack of nature, birds flying high in the backdrop of all blue sky and that famous Florida sun? It sounded exotic, and you can have all this in one humid afternoon—but set the bar low (especially if you're familiar with safaris). You see the alligator, right? Right?? Christian and I paid $40 each for an hour tour. We saw the backs of a small alligator on two occasions, so the tour guide mostly pointed out iguanas (we saw about seven of them?) because they were literally everywhere. You can pay a little extra to have your own airboat, though we didn't want to spend more than an hour, so we were herded into cattle-call airboat with about a 20 visitors, including a few babies. Because babies love alligator sightings, right? What I love about safaris is that you go on these long drives and just zone TF out. It can be up to an hour just driving around, looking for game, and that's when you have reflective moments. In the Everglades, our guide got on the mic every 46 seconds with jokes, promises of actually seeing an alligator, reiterating facts he already stated. He was amazing, but there was a point I wanted to jump in the gator-infested swamp and swim back to shore. Airboat tour in the Everglades. 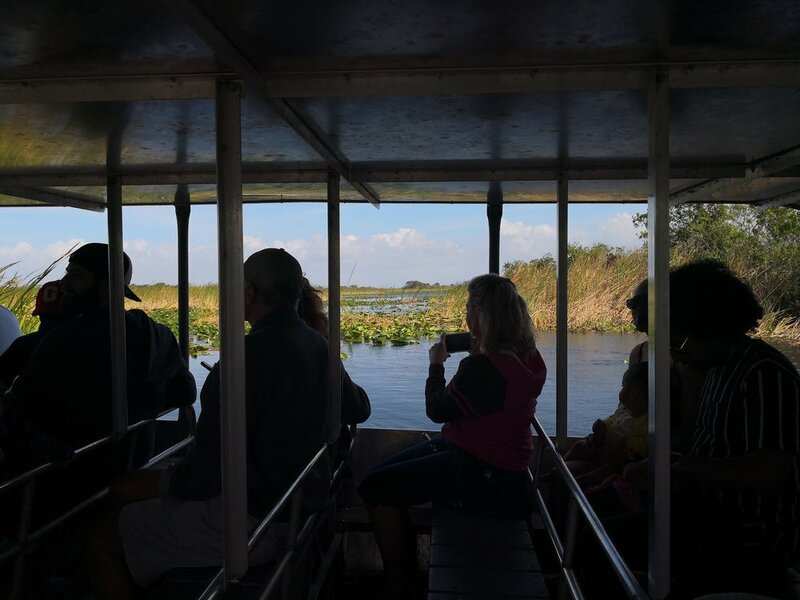 While animal sightings are never guaranteed on safaris, the alligator tour in the Everglades was not a safari. It's a tour, which means you'll see a gator or two, but maybe not in full. At least babies will appreciate it. So should you bring your baby on an airboat tour in the Everglades, knowing you will see half an alligator and seven iguanas? As long as you remember: it's the Everglades, not a safari.